At the close of the Buffalo Bills 2012 regular season, head coach Chan Gailey was fired. The call game as a result of Gailey’s record, posting three consecutive losing seasons since being hired in 2010. Gailey is just one of many members of the Bills organization that has failed to earn them a playoff appearance in 13 seasons. While the Bills have expired four coaches over 11 years, they have also gone through nine quarterbacks over the last 15 years, each one lasting less than 2 seasons on average. Current quarterback, Ryan Fitzpatrick, has averaged just 5 wins per season over the last four years. With the firing of head coach, Gailey, the Bills wasted no time filling the position. Just a few days later, the Bills announced that Doug Marrone was the new head coach that will prepare the team for the 2013 season. Marrone has had 7 years of NFL experience but his most recent experience is with that of the Syracuse Orange NCAA Division I football organization. After serving as the New York Jet’s offensive line coach from 2002 to 2005 and then the New Orleans Saint’s assistant coach, along side Sean Payton, from 2006 to 2008, Doug Marrone was hired as the Syracuse University head football coach. With previous ties to Syracuse, Doug Marrone described his hiring as head coach at the University as a “dream job”. His mission was to perform a complete makeover of a football program that had been in caught in a downward spiral since the late 90’s upon the graduation of Syracuse star quarterback, Donovan McNabb. Since then the program suffered immensely with attendance at the Carrier dome at an all-time low. The team continued to perform poorly with no sign of improvement under Greg Robinson, the man who replaced Paul Pasqualoni after he was fired due to a stagnant record and tired playbook. Doug Marrone ultimately replaced Greg Robinson and he immediately went to work. Marrone made it clear early on that he was in charge and that only serious players with proper attitudes had a place on the team. Marrone brought in all new staffers and did not hesitate to revoke scholarships from players that were deemed unworthy. His move freed up room for new talent that would fit with the program he had detailed while also setting an example for what the tone would be like under the next four years of his leadership. With hard work and discipline, Marrone successfully helped the Syracuse football program turn a corner. He led the Orange to two 8-5 seasons and received bids to two Pinstripe Bowls, victorious in both appearances, with the most recent coming on December 29, 2012 against West Virginia. Marrone is expected to work the same magic in Buffalo that he did in Syracuse, using his disciplinary tactics, intelligent recruiting and uptempo offense to revamp the desperate Bills football program. Where do you think Chandler Jones will get selected at? Mike Ortiz Jr.: Why did you choose Syracuse University? Ortiz Jr.: What was your favorite moment at Syracuse? Ortiz Jr.: When you guys won the Pinstripe Bowl, whose idea was it to high five everyone while running through the snow? Ortiz Jr.: How did you like it? Ortiz Jr.: Take me through a whole day at the NFL combine. Jones: At the NFL combine I’d wake up for a drug test at 5am. Eat breakfast. Sit through NFLPA meetings for about 3 hours. Go back to the suite to search and then meet with teams all the way until 11:30pm. Ortiz Jr.: What was it like having your Pro day at Syracuse? 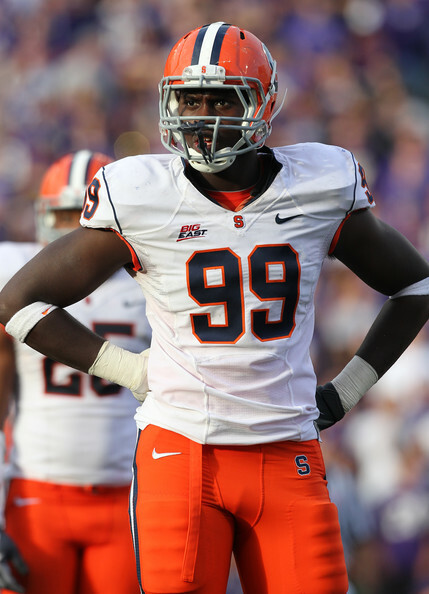 Jones: Having a pro day at Syracuse was pretty…Less nerve wrecking and I felt at home and more comfortable. Ortiz Jr.: What do you think you can bring to an NFL team? Jones: I think that I can bring pure heart and dedication…Someone that has the potential to dominate a season. Ortiz Jr.: Would you rather be teammates with your brother or play against him? Jones: It does mater if me and art were on the same team or not.. I’m just glad that we both have the opportunity to play pro. Ortiz Jr.: Has your brother given you any advice throughout this process? Jones: My brother told me everything to expect going through drills and meetings which gave me the edge over other prospects. Ortiz Jr.: Have you improved on anything since leaving Syracuse, if so what? Jones: Since leaving Syracuse I’ve became a better player, man and teammate…Coach Marrone did a great job of developing me into a complete player. Ortiz Jr.: Do you stay in contact with any of your old teammates and coaches? Ortiz Jr.: What was the best advice that you’ve received and from who? Jones: The best advice I received was from myself and my heart on making my decision to make a transition to the NFL. Ortiz Jr.: Where do you think you’ll be selected at? Jones: I don’t know where I will picked…I just want to play football again. Does Cam Newton have your vote? You see advertisements all the time from people asking for your vote. Most of the time these people asking are government officials, senators, politicians, something along those lines. However, for Carolina Panthers quarterback, Cam Newton he’s asking for yours. Posted on Youtube by SportsNationESPN, Newton in a seven minute long video pleads his case to be on the cover of this years edition of EA Sports, NFL Madden 13 video game. With just about one day left to vote as the winner will be announced at 5 P.M. Eastern time on ESPN’s television show, Sports Nation aired on ESPN 2, Newton, is looking for all the votes he can get. Matched up against the number sixth seed, Detroit Lions wide receiver, Calvin Johnson who lead all wide receivers last year with 1,681 yards and 16 touchdowns is hard player to go up against. 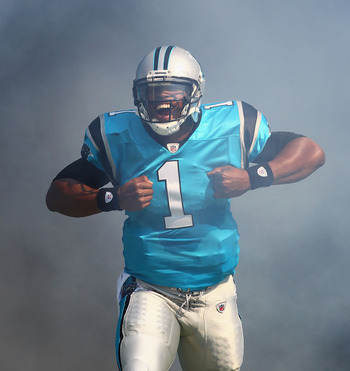 Though, despite facing a very notable player, Newton, is the number one seed. Newton, NFL rookie of the year winner through for 4,051 yards last season, an NFL record for a rookie quarterback also rushed for 14 touchdowns, that too an NFL record for most rushing touchdowns by any NFL quarterback ever. To get to the Madden Cover vote finals, Cam Newton etched out San Francisco 49ers linebacker, Patrick Willis by six percent winning, 53 percent to 47 percent of all voters. As for Johnson he dominated Green Bay Packers quarterback, Aaron Rodgers winning by 34 percent, 67 percent to 33 percent of all voters. So, in the second year of the Madden cover voting, does Newton have the upper hand as the number one seed? He did make a seven minute long video? Or does the number six seed, Calvin “Megatron” Johnson have the upper hand? No one knows and no one will know, until tomorrow at 5 P.M. Eastern time. Wide receiver Brandon Lloyd is heading to New England. Months after losing to the New York Giants yet again in the Super Bowl where they lost 21-17, the New England Patriots who were criticized for not having a deep threat wide receiver in their system almost had to acquire one this off-season. However they had to be more careful this off-season as they didn’t want to make the same mistake they did last season when they acquired wide receiver Chad Ochocinco, who had his worst season of his career with the Patriots last season (15 receptions, 276 yards, and one touchdown). So with not even a week into free agency the New England Patriots did what most were waiting for as they signed a deep threat wide receiver, Brandon Lloyd. 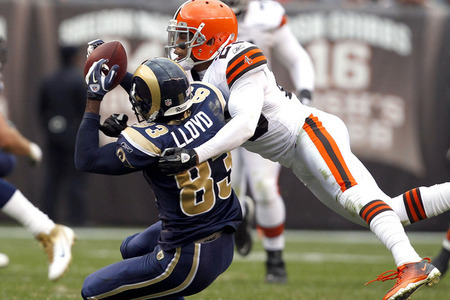 Lloyd, who was traded from the Denver Broncos to the St. Louis Rams last season, caught 51 passes for 683 yards and five touchdowns in just the 11 games that he was with the Rams last year. As for his overall career, Lloyd has played with five teams before currently joining the New England Patriots (San Francisco 49ers, Washington Redskins, Chicago Bears, Denver Broncos, and the St. Louis Rams) and besides the Washington Redskins he contributed very well to all of the teams that he was apart of, including in 2010 where he lead the league in receiving yards with 1,448 yards. Also in that career season that he had with the Denver Broncos Lloyd, also caught a career high 77 receptions and a career high 11 touchdowns. Lloyd who’s played with several different quarterbacks throughout his career, Jeff Garcia (San Francisco), Tim Rattay (San Francisco), Ken Dorsey (San Francisco), Alex Smith (San Francisco), Mark Brunell (Washington), Jason Campbell (Washington), Todd Collins (Washington), Kyle Orton (Chicago), Rex Grossman (Chicago), Kyle Orton (Denver), Tim Tebow (Denver), Sam Bradford (St. Louis), A.J. Feely (St. Louis), and Kellen Clemens (St. Louis) will now have the opportunity to play with one of the best quarterbacks of all time and his best quarterback that he’s had in his career so far. So with a deal that is still disclosed besides the fact that Lloyd is now a Patriot, the New England Patriots come this 2012-13 NFL season will have number unknown, Brand Lloyd suiting up for them. 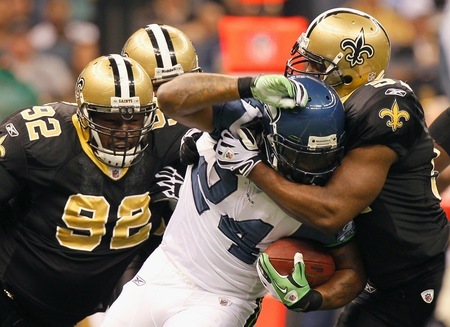 New Orleans Saints Johnathan Vilma wraps up Seattle Seahawks running back Marshawn Lynch. Now while there have been many past cases or rumors of teams doing or putting out bounties, news today broke that not only the New Orleans Saints were doing it but between 22 out and 27 defensive players as well as at least one assistant coach was apart of the Saints bounty program. Reports say that the program was maintained by an assistant coach that was in charge of a bounty pool that had up to $50,000 in it. Knockouts were worth $1,500 and cart-offs were worth $1,000. Those payments were doubled, sometimes tripled for playoff games. Reports also say that some of the opposing players that were targeted were quarterbacks Brett Favre and Kurt Warner. “In the week of the NFC Championship Game,” Adam Schefter said on NFL Live Friday, “Saints linebacker Jonathan Vilma put $10,000 in cash on a table and said ‘this goes to the guy that knocks out Brett Favre.’” Those weren’t Vilma’s exact words, but they were similar to those, ESPN’s Adam Schefter said. Vilma or any other player from the Saints Organization has yet to respond. The Saints have yet to suffer any consequences or penalties as this is all just speculation and rumors at this point though it doesn’t look good as it seems true as there was a league release statement. However if this is true, the Saints could face some serious penalties such as, loss of draft picks, suspensions, and definitely huge money fines. The league release also mentioned that Saints head coach, Sean Payton was not involved in the bounty program, though he was aware and as we know he didn’t do anything to try and stop it. Drama In Pittsburgh? Will It Ruin The Pittsburgh Steelers Organization? Ben Roethlisberger and former offensive coordinator Bruce Arians. After being fired on December 12, 2011 after leading the Kansas City Chiefs to a 5-8 record, head coach Todd Haley would later be signed as the Pittsburgh Steelers offensive coordinator earlier this month. However there have been reports that superstar Quarterback, Ben Roethlisberger didn’t like the addition. 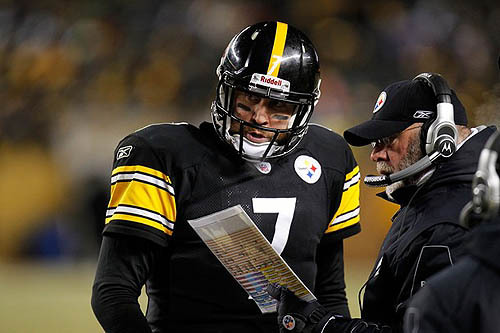 Though that wasn’t the problem as two weeks after being hired as the offensive coordinator, Todd Haley former coach of the Kansas City Chiefs has yet to call or respond to Roethlisberger’s comments with a phone call. “He still hasn’t called yet,” Roethlisberger told the Pittsburgh Tribune-Review on Monday. According to the Tribune-Review, Roethlisberger had a “discouraged” tone to his voice. So is it a bad thing that Haley and Roethlisberger haven’t spoke with each other yet? No, it’s not, however it is bad in the fact that Roethlisberger has wanted to speak with him. Now if Roethlisberger didn’t address that he wanted to speak with Haley then things would’ve been fine as it’s on February and the season doesn’t start until September. However, that’s not how things went as Roethlisberger made it clear that he wished to speak with Haley. Though we can’t put all the blame on Haley as it’s a two way street as if Roethlisberger really wanted to speak to Haley as bad as he’s making it seem to the media, then I’m sure he easily could. And if there was a problem such as Roethlisberger not having his phone number or something along those lines, then it could easily be fixed with a simple phone call to management or someone along those lines. So in a world that we live in where everyone loves to point the finger at the person that at the time seems the “most wrong” is in fact wrong for doing so as like there is in everything, there are two sides to each story. So no worries Steelers’ fans, there’s no problems here as of now all it really is just a situation like a kid [Ben Roethlisberger] who had to experience that his parents were getting a divorce and that his dad [Bruce Arians] was moving out and now a couple months later his mother [The Steelers Organization] is getting a new boyfriend/step dad [Todd Haley]. Is The Super Bowl A Must Watch? At 6:29 Eastern Time the world will stop as nearly everyone will all tune into, if they haven’t already, to Super Bowl XLVI on NBC. They’ll tune into watch the rematch of 2008. They’ll tune into watch the rematch of week 9. Most importantly, they’ll tune into watch the match up of the 2011-12 NFL season, the NFL Super Bowl between the New York Giants and the New England Patriots. But why will they tune into that? Instead of Undercover Boss at 7, ABC World News with David Muir at 6:30, or America’s Funniest Home Videos right after, so you ask? Because it’s the SUPER BOWL! The game of all games, the broadcast of all broadcasts, and even the best commercials of all commercials. So let me answer your question with a question, why wouldn’t you tune into Super Bowl XLVI? Heck, even the United States Government wouldn’t dare to interrupt it even with a National message that told us that all our lives were soon to be in danger. The point I’m trying to get at here, is the Super Bowl is the game that your mom let’s you stay up late on a school night to watch. It’s the game that you miss your routine Sunday season episode for. It’s the game that Motel 6 won’t leave the light on for you. So get the old clicker out and DVR the shows that you’re going to miss as even the commercials will keep you entertained. Though, you don’t have to watch the Super Bowl. Except come Monday morning when you head to school, work, the grocery store, or where ever it may be, you will be that guy…or girl. That guy or girl, that watched the news instead, went to bed early, watched the season premiere of Napoleon Dynamite. So, let me ask you, do you want to be that guy…or girl? No you don’t. So come 6:29 grab the remote, get of the lazy boy to turn the channel, fix the bunny ears, do whatever it takes to tune into Super Bowl XLVI, because trust me, you won’t regret it. Osi Umenyiora answering questions at NFL media day. New York Giants defensive end Osi Umenyiora will be fined $20,000 for not attending a mandatory media day Wednesday. Umenyiora was fined not to long after he didn’t show up for his 45 minute mandatory news interview session at the teams’ hotel Wednesday morning. Due to not having a medical excuse like New England Patriots offensive tackle Matt Light had for Tuesday, Umenyiora was fined. So what’s wrong with that? He showed up on Tuesday and said what he had to say and answered what he had to answer, I mean let’s be honest what more could you obviously talk about him with him today? What’s his favorite color? What does he like to do in his free time? Is he dating anyone? Like seriously, what could the media have asked him? They already covered the Super Bowl questions, the rematch questions, the Matt Light questions, and on and on and on. Now for tomorrow’s media day, they actually could have some things to ask, like why weren’t you at media day? Your response to Light’s comments and maybe what he had to eat yesterday? But fining the guy $20,000 for not showing up for 45 minutes to listen to repeated questions over and over again? Heck I would probably skip it too. So Osi, as bad or as boring as it may be just go to the 45 minute session tomorrow and answer to the questions that are asked, or if you’re going to skip at least tell them your sick…cough cough. "Are you kidding me?! "-Jim Mora, wouldn't even be able to describe NFL Championship Sunday 2011-12. Yesterday’s Championship Sunday in the NFL may go down as one of the most memorable Championship Sunday’s off all time. From the way it began all the way to how it ended. Starting the day off the world was awoken to the news that Joe Paterno died of cancer. After being reported falsely by CBSSports.com late Saturday night that he died family members came out saying that the reports weren’t true and that Paterno was still fighting. However, come Sunday January 22nd Joseph Vincent Paterno had passed away. Moving on from Paterno’s death the Baltimore Ravens would take the field at Foxboro, Massachusetts to take on the New England Patriots. It was a back and fourth game from the start but the scoring would be put on hold after the Patriots took the lead off of a Tom Brady touchdown early in the fourth quarter giving the Patriots the lead 23-20. However despite not being able to score sooner, the Ravens with 29 seconds remaining had a chance to win the game; until it happened. It was a 2nd and 1, ball on the 14 yard line when Ravens quarterback Joe Flacco stepped back, fake, then threw into double coverage to wide receiver Lee Evans, touchdown! The announcer exclaimed. However Patriots safety, Sterling Moore would knock the ball lose forcing Evans to drop the ball, ending in an incomplete pass and no touchdown. Though it wasn’t over yet as it was 3rd down with 22 seconds left and the Ravens still had one more timeout. Flacco would try to complete a pass to tight end Dennis Pitta however it would end up incomplete as well. Though, it still wasn’t over as the Ravens were in field goal range and they were down by two. It was a 32 yard field goal, an easy one, a gimmie, right? All Ravens kicker Billy Cundiff had to do was just step back and kick it as he was faced with a kickers dream. Instead it happened again. Cundiff’s kick was up and wide left. The home crowd was lifted by a sea of cheers as the New England Patriots were going to the Super Bowl. Next up was a showdown between the New York Giants and the San Francisco 49ers. It was another back and fourth game that the 49ers were leading heading into the fourth quarter when they made another stop on defense forcing the Giants to punt. It appeared that with the 49ers getting the ball back again, that the Giants Super Bowl hopes were dwindling as with 11:17 left on the clock and trailing by four things just didn’t look good. But then, it happened again. It was a punt that was almost blocked by the 49ers that ended up traveling close to 50 yards until being waved off as a fair catch by returned Kyle Williams. However, Giants wide receiver Mario Mannigham who came running down the field picked the ball up and continued running until he reached the end zone where he signaled that the ball hit Williams’ knee. After looking at a replay, it did appear that the ball did hit Willimams’ knee which meant Giants ball at the 20 yard line. Then seven plays later after the Williams turnover, touchdown Giants, 17-14 Giants lead. However unlike Evans and Cundiff, Williams was luckily bailed out by the 49ers great defensive play and kicker David Akers as he would kick the game tying field goal to send the game to overtime. Then in overtime after stopping the Giants offense yet again, the 49ers would force them to punt. However it happened again. Instead of calling a fair catch like he did last time, Williams, caught the ball and began running until falling to his feet. But that wasn’t it as when he was falling, he lost the ball and after reviewing the play, it was a fumble, Giants ball. Despite being in field goal range the Giants ran the ball a couple times to assure the win as they too heard about the Cundiff miss and didn’t want it to happen to them. However, it would happen again. Though not another crazy screw up or a miss, but Patriots, Giants, Super Bowl rematch…the improbable prediction, would happen again.